Тураев Б. З., Курбанов С. К. 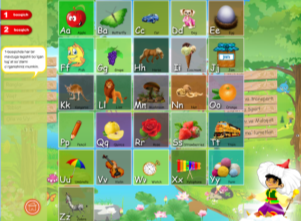 The advantages of creating the tutorial multimedia applications of educating english for pre-school and school age children // Молодой ученый.  2015.  №24.  С. 1031-1034.  URL https://moluch.ru/archive/104/24140/ (дата обращения: 19.04.2019). In the current article, the advantages are discussed of using the tutorial multimedia applications in learning English by pre-school and school age children. Moreover, the opportunities and using process of application “Funny English” is presented. Today it is fact that the government is regularly reforming the educational system year by year. The main purpose of these reforms is to reach the quality of personnel preparation to the international standards. According to these reforms the modern pedagogic technologies are widely being implemented in all education phases and built new modern educational buildings in our country. These reforms are being done under the legal basis which consists of the Decree and Resolution of the President of Uzbekistan. For example the resolution about “The measures of developing the system of studying foreign languages” was accepted by the President Islam Karimov on the 10th of December in 2012. This Resolution is oriented for educating English in the Republic on the basis of the standards of the world. In particular, we should tell about practical works in the area of educating English for pre-school and school age children. While educating English for children we should allow for their psychological and own possibilities. Therefore, nowadays the education system needs modern manuals and multimedia educational applications, which have been written and created for different aged children. The solution of this problem depends on not only English teachers but also specialists of information technologies [2, 3]. The current article is about a tutorial multimedia application which was created with the opportunities (pictures, colorful views) of the audiovisual technologies. The application is oriented for developing the process of the educating English in the initial stages of the educational system. If we clearly describe the article it consists of some information about the opportunities of the multimedia application for teaching English effectively, advantages of using computer graphics programs while creating the applications, developing the area of the using the application. From the education year of 2013–2014 in our Republic, many processes have been done about teaching foreign languages exactly English by the government. For instance, simple speech lessons have been tutored as speech games for first classes of school and the alphabet of English has been taught for second classes and for the next classes English lessons have been gradually taught which consist of reading and grammar. According to this processes the elementary classrooms of the all schools of the Republic have been provided English literatures and dictionaries  and DVDs of multimedia lessons. The state education standard of educating the foreign languages has been made. The book is named “Kid’s English” has been used in teaching English for 1st classes. Nowadays the number of the multimedia tutorial applications for pre-school and school age children is rising day by day. Of course, it depends on widely using information technologies in pre-school education system, for example nursery schools. In the result in this kind of places the quality of education and the process of educating is developing. The information technologies have an important role in the community. They can hasten the process of knowing and spreading and using new knowledge by the community. Moreover, information technologies improve the intellectual resources of the society and get better the quality of life. The multimedia technologies are one of the perspective and universal types of the information technologies. They contain sound, video, animation and visual effects. The multimedia technologies allow creating compositions, hypertexts, interfaces, controlling mechanisms. After appearing the multimedia technologies many changes have been done in the education system, the professional processes, the spheres of science and art. Multimedia data consists of not only traditional statistic elements (text and graphic) but also dynamic elements (videos, sounds and animation). Statistic graphic images are presented with vector graphics and pictures. According to information the children are able to understand 95 percent of visual information which have been presented with pictures and graphics. Visual information can be accepted easier than text information.  After using the multimedia application the children are easily able to imagine and creative. Computer graphics is a very wide discipline, so we want to focus our attention on one type of these kinds of applications, the Real Time ones. Their main characteristics are, the use of 2D and 3D graphics, a very important degree of interaction, a realistic answer to the user actions and immersive possibilities, depending on the equipment used . Due to the kind of people who are going to use our tools, all of them are non-immersive Real Time applications, which only need a computer (with screen, keyboard, mouse and joystick) to use and interact with the tool easily. This option was selected in front of other more immersive versions (like using head mounted displays, cyber globes or caves installations) because it is cheaper and accessible for all the schools, associations and special centers, it is less invasive than other elements, the user can interact with the application easily almost without previous training and it allows for collaborative work between the teacher and the child. Some tests were done with the same version of the tool but one using immersive equipment (head mounted display and cyber globes) and another using tactile screen and joystick. The answer of the participants (all of them with learning difficulties) suggested higher levels of acceptance and interaction in the non-immersive version, easier adaptability to the interfaces used with less previous training and better interaction between the child and the teacher. When the type of application to be used is clear, it is necessary, during the design process of any tool, to specify the characteristics of the final group of people who are going to use it. In our case, it is important to know the specific profile of individuals with learning difficulties and to determine the content that the application may have to satisfy in the areas of knowledge that are necessary for their intervention and educational process. For that reason, before defining the possibilities of using this kind of software to help people with learning difficulties, we want to define in more detail the group of people to whom these tools are addressed.  The program is able to match for any types of Operation Systems . The program is so popular in area of animation designers therefore why we have chosen Adobe Flash for creating the current application that are called “Funny English” and tutors English. The application has more possibilities than to other pedagogic methods. The application contains the heroes of Uzbek national tales and fruits and the pictures of other subjects what the children always use in daily life. The application has created so simple even the children are able to use it themselves. After using the application the possibility of knowing and learning English possibilities of children have increased. After listening English letters, the children are able to pronounce fluently the letters. The application has got the registry number of 2182 in the Uzbekistan Fundamental Library of Academy of Sciences Republic and it is being used in practice.  The total storage of the program is not so large that is why you can use the application on the different configured computer. Creating the tutorial multimedia applications is one of the popular parts of the computer graphics. On these days, these kinds of applications are becoming the main resources of the media distance education. The application “Funny English” which has created on base Adobe Flash animation program will have an important role in the education process in the future. In addition, if many tutorial multimedia applications are created the process of teaching English will be developed. In this case the education system of Republic should provide this process. Bent B. Andresen, Katya Van den Brink. Multimedia v obrazovanii: spetsializirovanniy uchebniy kurs / Bent B. Andresen, Katya Van den Brink. — M.: Obuchenie — Servis, 2005. — S. 36–43. Bim I. L. Nekotorie aktualnie problemi sovremennogo obucheniya inostrannim yazikam. — IYaSh. 2001. № 4. — S. 37–90. Galskova N. D. Sovremennaya metodika obucheniya inostrannim yazikam. — M.: Izdatelstvo ARKTI. 2003. — S. 49–127. Nazirov Sh.A., Nuraliyev F. M., Tillayeva M. A., Rasulbayev M. M. Flash texnologiyalari. — Т.: Cho’lpon. 2012. — 114 b.
Основные термины (генерируются автоматически): ARKTI, XML. Метод автоматизированного анализа электронных документов в формате XML. Белорусов Артем Игоревич, младший научный сотрудник. Для начала требуется загрузить нужные классификаторы XML и входное изображение (или видео) в монохромном сером режиме. Эти каскады можно вызывать непосредственно из кода без необходимости загрузки файлов XML. Применение AForge.Net иAccord.NET Framework в задачах распознавания лиц. На данный момент наиболее распространенными форматами передачи структурированных данных являются XML и JSON — оба они представляют простые текстовые данные. Хранилище типа ключ-значение для примитивных типов данных, которое представляет собой обертку над XML файлом, хранящимся на устройстве.